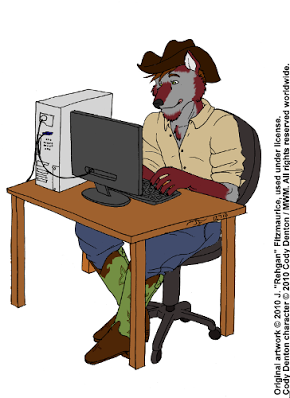 Cody Denton is a cowboy wolf who first came to the furry fandom in June, 2009. When he’s not herding cows or mending fences, he can be found building websites, attempting to learn to draw, or writing about his cast of characters (including a character somewhat confusingly named after himself). He notes with characteristic irony that he has been writing since way back in the dark ages, when the first generation of electric typewriters had just replaced the chisel and stone tablet, and the “delete” key was a bottle of White-Out. Although he’s a relative newcomer to the furry scene, he has had the good fortune to have a poem accepted for publication in Heat v.8, due out in summer 2011 from Sofawolf Press. He is reported to be working on some assorted other poems and short fiction, although given his self-professed streak of procrastination, some of those will likely not come to fruition until the last hours before a deadline. Rumor has it that there has been a novel in the works since the days of his first 286 computer, but our sources tell us that it has been collecting dust for a long while (and shockingly, is not furry-themed to begin with). Perhaps even more shocking, our sources also tell us that somewhere in his collection of electronica, Cody still HAS that old 286 computer — amid several other relics from the dawn of personal computing. Cody is happily mated to Mishi Cougar, proving once and for all that felines and canines really can be wonderful partners. They share their lives with three dogs, a quintessential collection of kitschy odds and ends, and more cowboy boots than either one of them can wear in several lifetimes. Readers wishing to contact Cody may do so via his website at www.codydenton.com.